When an end-stage renal failure occurs (that is, when the kidney function is irreversibly reduced to below 15% of normal), there are two treatment options: dialysis or a kidney transplant (also known as a renal transplant). This page deals with Haemodialysis. The word ‘haemo’ refers to blood. Haemodialysis is a process that balances blood chemistry and filters wastes and fluid from the blood. For Haemodialysis, two needles are inserted into the patient’s arm. One needle withdraws the blood and the other returns the filtered blood to the patient’s body. The blood, which is withdrawn by the first needle, travels outside the body through the tubing and the dialysis machine then pumps this blood through a filter called a dialyzer, which is attached to the dialysis machine. The dialyzer cleans the blood and it is returned to the patient’s body through the other needle. The dialyzer is also called an artificial kidney because it is an artificial replacement for the patient’s damaged kidneys. 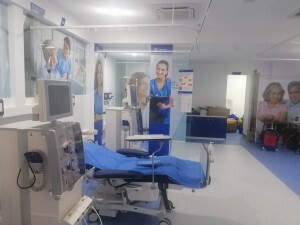 During the process of haemodialysis, the haemodialysis machine circulates the dialysate (fluid with chemicals that helps to remove wastes from the body) to the artificial kidney. 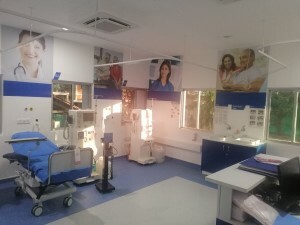 Haemodialysis is typically performed at a dialysis center. Haemodialysis is performed at NU Hospitals with sophisticated equipment (volumetric, bicarbonate machines). 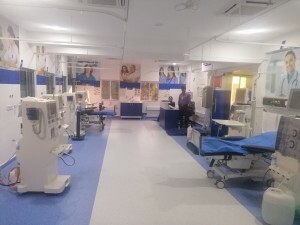 We have 14 state-of-the-art machines [13 of them in the Haemodialysis unit and 1 in the intensive care unit (ICU)]. 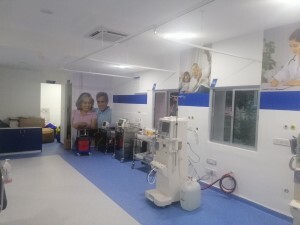 A state-of-the-art reverse osmosis plant purifies the water used for haemodialysis. Periodic cultures of the reverse osmosis water are performed to ensure good quality of water. We perform around 13 to 14,000 dialysis per year. 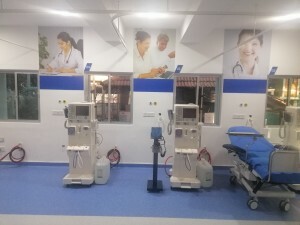 State of Art Fresenius Haemodialysis. Special dialysis couches at each individual station. Daily monitoring and audit of patient and machines. Personal & Individual attention by Senior doctors. Specialized training & practice for the dialysis team member to carry out cannulations in OT and on mannequins. Strict adherence to medical protocol and hospital best practices. 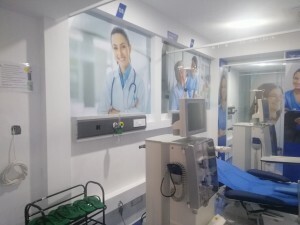 Dedicated machines and space for HBsAg and HCV positive patients. Specialized Plex RO ( Reverse Osmosis ) pipeline, imported from Germany.